In his heyday, the late 1950s and then the glittering 1960s, no one could beat Dean Martin. He was a film star, had a hit television show, had been crowned the king of nightclubs, and formed one half of the history of show business’ most popular comedy duo. His friends were the likes of Frank Sinatra, Sammy Davis Jr, and even Marilyn Monroe. His records were selling in their millions, but his passion lay in a far more prosaic are of life: Golf. Martin was a complicated man, to say the least. The next time you’re playing the best online pokies Australia at home or on the go and one of his beloved classics comes on, you’ll be able to appreciate it a little more with these facts at your disposal! Martin’s family was Italian through and through, and he only started learning to speak English when he was five. 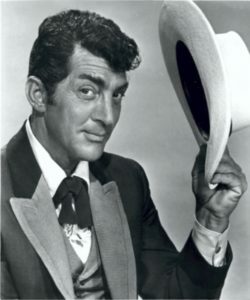 Born Dino Paul Crocetti, when he first started out in show business he did so under the name Dino Martini. There was a singer around at the time called Nino Martini, and so Martin took the name we all know him by to differentiate himself from the popular vocalist. Although Martin went on to appear in 16 very funny films alongside his partner, Jerry Lewis, he stated that he detested each one. He explained that this was because they were, essentially, Jerry Lewis films, and Martin’s role was simply that of the idiot. Although he had the image of a man-about-town, Martin was not fond of parties. He said this was because he was shy, and also thanks to being embarrassed about the way he spoke. He disliked get-togethers so much, actually, that he once called the police on one his own wife was hosting! Jeannie, Martin’s spouse, had thrown a party at the mansion the couple owned in Beverly Hills. Martin holed up in his room to watch TV instead, as was his habit. As the party grew louder, Martin called the local police station, pretending to be a neighbour irritated with the noise from the festivities. The police duly arrived and broke up the celebrations! In 1968, Martin signed the largest contract in the history of show business agreements. He agreed to a three-year contract for US$34 million for three more series of his hit television show. But it was a unique contract. Martin greatly disliked rehearsing, and so his contract said that he would not have to do so during the week. A stand-in would take his place for the dry runs, while Martin played his golf games from Monday through to Thursday. He would look over his lines during this time as well, but most of his time was spent on the course. Then, on Fridays, he would show up and get the taping done.